[無料] MorphVOX Echo | Mac App Storeのアプリ検索・ランキング BuzzMac! 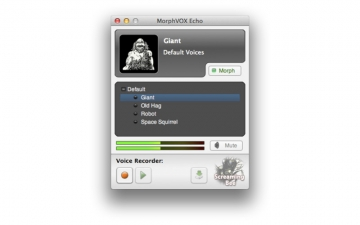 MorphVOX Echo is an easy-to-use voice altering program for the Mac OS X platform. Morph your voice into a robot, old woman, giant or our ever popular space squirrel. It learns from your own voice using Screaming Bee's Voice Doctor to produce optimal results. Record your changed voice and use it for your next audio project or just for fun. - Send friends funny voice messages.